This book lists the 36 Tesla coil input and output parameters used in the popular user-friendly Tesla coil design program, JHCTES versions 3.1 and 3.3. Design and engineering information are given for each parameter showing how they effect the design and other parameters in the program. Also presented is information on Tesla coil safety and grounding, critical coupling, Q factor, VSWR, and Tesla's second Colorado Springs oscillator. There are 11 sections and 11 illustrations. Test your next oscillator design before investing in the materials to build it. 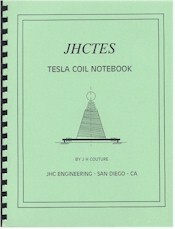 JHCTES version 3.42 Tesla coil CAD program online.